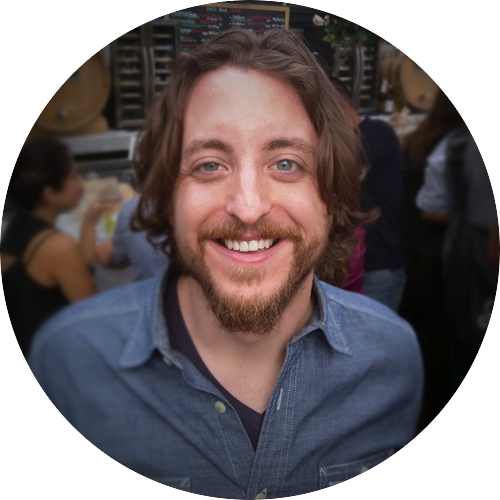 I am an Android developer with practical experience from a bootcamp created in collaboration with Google, a theoretical foundation from a master’s in CS, a logical foundation from a BA in math, plus communication and management skills from nearly a decade of consulting. I care as much about reducing my colleagues' stress levels as I do about the product we're creating. Whether it's adherence to styleguides and pull request protocols, or just basic time management, my priority is to be dependable and put minds at ease. Inspired by the classic analog etching toy, this app lets you use two knobs to sketch anything you can imagine. This app was a good opportunity to implement some custom Android views for the knobs/dials, use the accelerometer to detect shaking, and use FileProvider to share content to other apps. 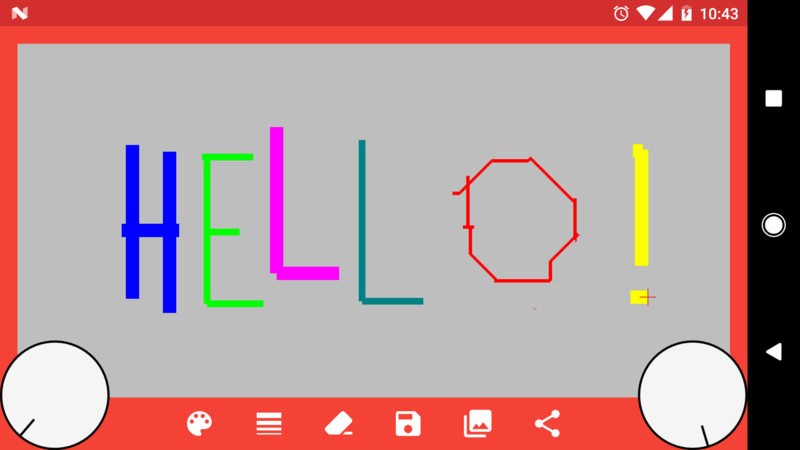 The user’s etchings are rendered to the screen using Android’s Canvas and SurfaceView APIs. Share your etchings to social media, messaging apps, etc. For my first game I decided to build a simple game engine from scratch. Every frame is drawn in 2D using Android’s Canvas and SurfaceView APIs. I managed to achieve >55 FPS on average on a Nexus 5; newer devices should hit 60 FPS. 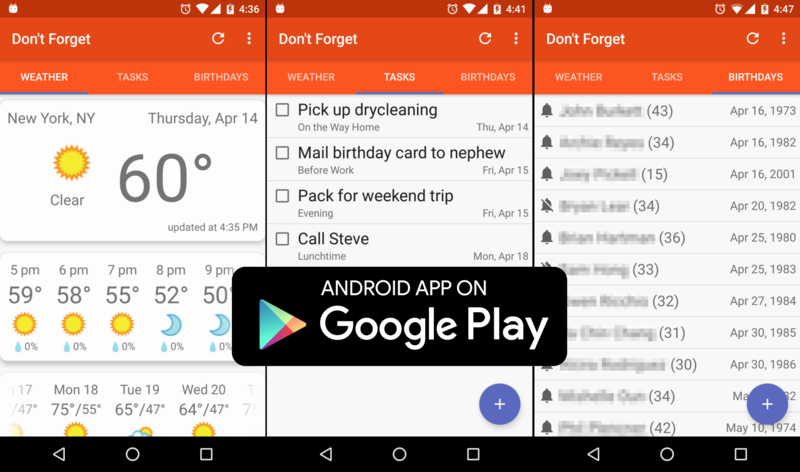 Don’t Forget is an app that delivers weather, task, and birthday reminders to users via notifications custom-timed to fit their schedule. The app is very customizable thanks to a robust set of user-controlled preferences on the settings screen. This project was a great opportunity to use some popular third-party libraries like Retrofit, Picasso, and Realm. It was also a good exercise in multithreaded, asynchronous programming, using a Sync Adapter to gather data from the Weather Underground API and Intent Services to schedule and launch notifications. Quick Tap was named runner-up in a hackathon sponsored by General Assembly and HPE Haven OnDemand. 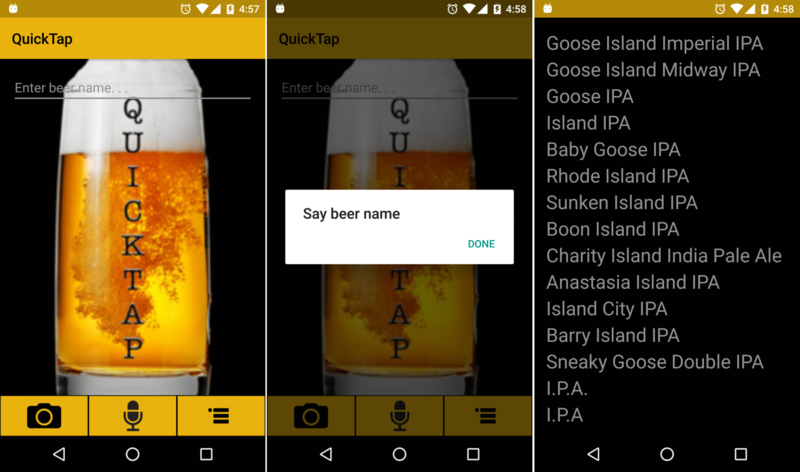 The app allows users to search for beers by voice, check them in, and order via SMS. I teamed with 2 other developers and we completed everything within 48 hours to meet the hackathon deadline. 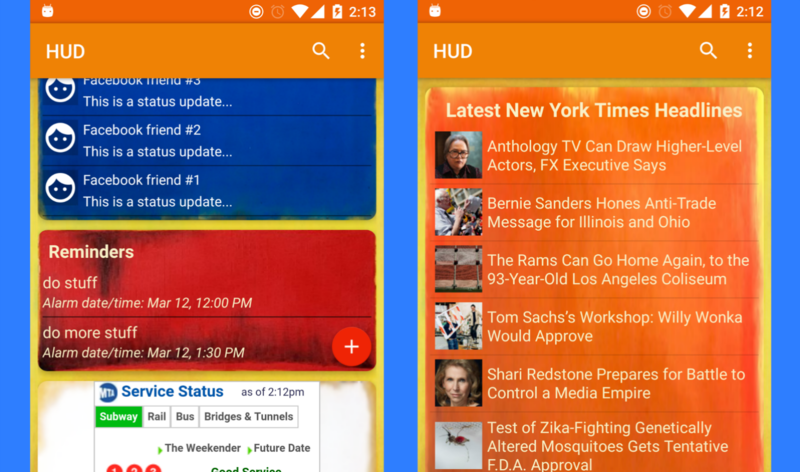 HUD, short for Heads-Up Display, is a quick info card app with news, a to-do list, and a subway status widget. 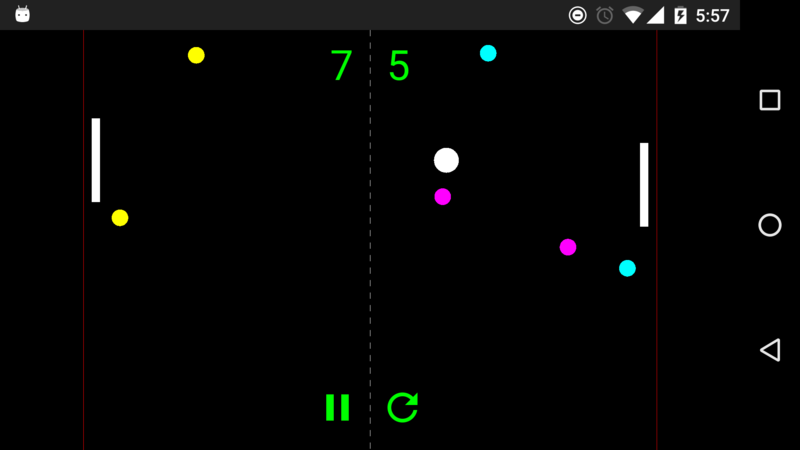 I built HUD with a team of three other developers one week as part of General Assembly’s Android development bootcamp. The news headlines/links are pulled from the New York Times API. I built this simple email client in just a couple days as a project for General Assembly’s Android development bootcamp. 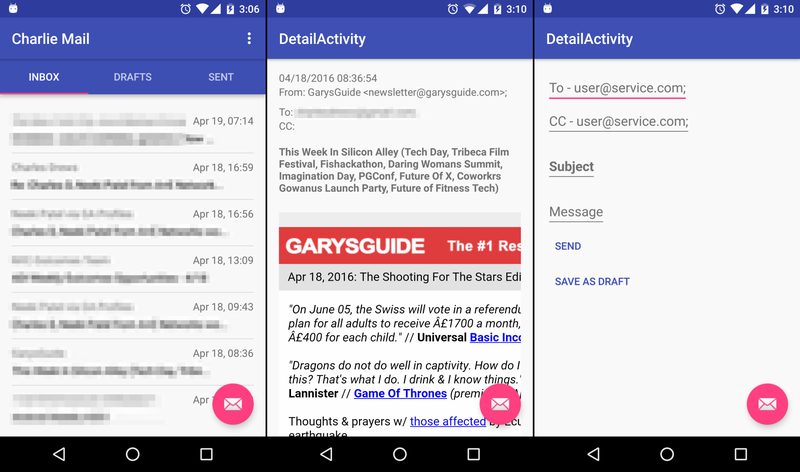 I used Google’s Gmail API as well as their API Client Library for Java. 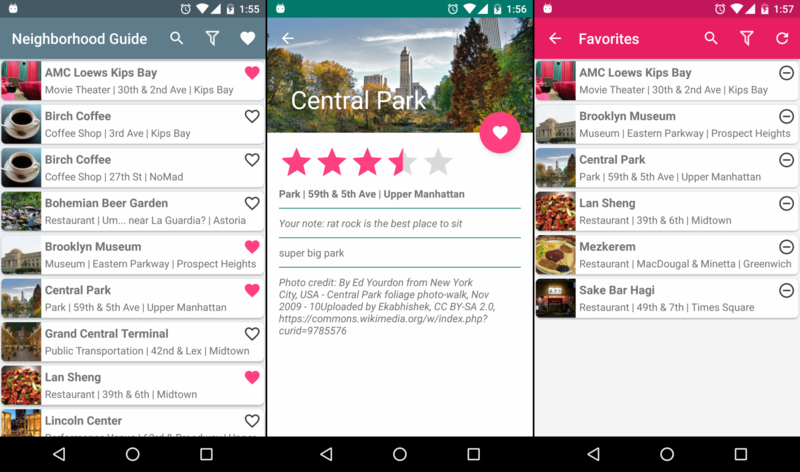 Neighborhood Guide is an app that allows users to browse a selection of local destinations, save their favorites, and add ratings & notes. This app was built as a project for General Assembly’s Android development bootcamp. The list of sample locations is stored locally in a SQLite database, along with user input such as favorite status, rating, and notes. Future versions will utilize an API such as Google Places to provide a dynamic list of places based on the device’s location. This project is a blogging platform created for a school assignment. It was written in Python using the webapp2 framework and Jinja2 templates, and was deployed on Google App Engine. 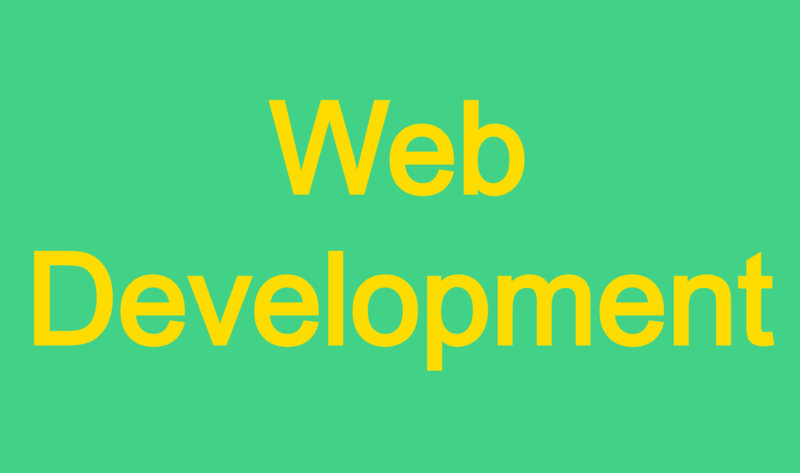 This project contains the subset of the source code I wrote for a Content Management System (CMS) application created for a school assignment. It was written in C# using the ASP.NET MVC framework and Razor templating, and the full application was deployed via Microsoft Azure. 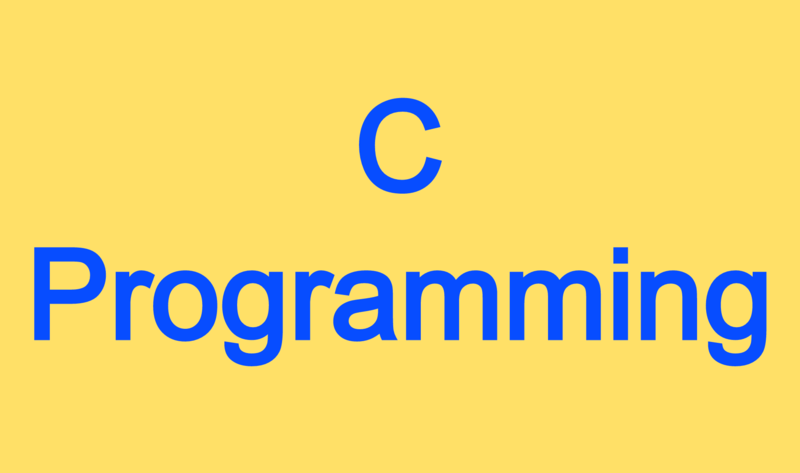 This project is a virtual machine emulator which was written in C for a school assignment. The emulator will interpret and execute assembly code written in a simplified subset of the x86 assembly language. This project is a virtual machine profiler written in C for a school assignment. The profiler generates basic block profiles and a control flow graph from a target application’s instruction address stream. It is intended as a demonstration of a profiling feature that could be added to a hypothetical virtual machine manager. This project is a Natural Language Processing (NLP) tool created for a school assignment. The tool automatically extracts key information from press releases announcing the release of musical albums. It was written in Java using the Jet NLP toolkit. This is a research project created for a school assignment. The project explores the optimal topology for interconnection circuitry between cores of a multicore, Network-on-a-Chip (NoC) processor for a given target application being executed on that NoC processor. The code for the project was written in Python. I also used the Multi2Sim simulator to test my theoretical hardware topologies.